Nigeria president Muhammadu Buhari don ask kontri pipo to comot well-well to vote inside di supplementary elections wey di Independent National Electoral Commission plan for 17 states. INEC wey be Nigeria elections office bin announce say 17 states go do election again on 23 March because of one or two mata wey happun for those areas during di presidential/senatorial election on 23 February and di govnorship election on 9 March wey affect di outcome of di result. Five out of di 17 states na im go do additional govnorship election and dem be Bauchi, Benue, Kano, Plateau and Sokoto States. Adamawa suppose dey part of dem but one court order don tie INEC hand ontop di mata. 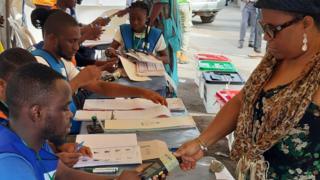 INEC say di law ontop general elections na im make dem decide say dem need to do new elections for some polling units. Part of di law tok say if elections no happun or dem cancel am for any polling unit, INEC need to organise anoda one. Report of low voters turn-out during di govnorship election fit be di reason why Oga Buhari feel say im need to ginger pipo to commot come vote. Make una stay wit us as we go dey give una update on how di election dey go.